I’m a huge fan of huevos rancheros, something we could enjoy often when we lived in California. However, I’ve found making it at home a little challenging because it’s difficult to make in large quantities for our family of five. This casserole is a fantastic solution. . . trust me – this is the very first recipe I’ve ever had on the site called “casserole” so you know it has to be pretty darn good. 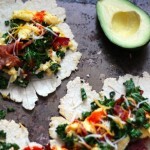 Huevos rancheros is typically a Mexican breakfast dish, but I love this for any meal of the day. When I made this, we ate it for dinner and every member of the family thoroughly enjoyed it. What’s not to love about eggs, tortillas, cheese, and beans all cooked together in red sauce? You begin by layering crisp corn tortillas in the bottom of the pan, followed by enchilada sauce, black beans, and cheese. Top with another layer of crisp corn tortillas. Add more enchilada sauce, followed by cheese. Then crack 10 or so eggs on top and season with salt and pepper. Bake until bubbly and melty, when the whites are just set and the yolks are still runny. Marvelous. Dig in. Preheat oven to 375. Grease an 11x13 baking dish. Layer half of the torn tortillas in the bottom of the dish. Top with half of the enchilada sauce, followed by half of the cheese, then sprinkle all of the black beans over the cheese. Repeat layers - tortillas, sauce, cheese. Carefully crack 10-12 eggs (eyeball it, depending on the size of your eggs) on top of the casserole. Season eggs with salt and pepper. Bake until egg whites are fully set but yolks are still runny, 20-30 minutes. Mine took about 24 minutes for results as pictured. Watch the eggs closely once you hit the 20 minute mark to avoid overcooking the yolks. Sprinkle chopped cilantro over top. Offer avocado, sour cream, and salsa/hot sauce on the side.